This Guide is intended as an aid for Judges/Circle Marshals, Officials and Organisers as well as Competitors of how to interpret, understand and use the Sporting Code Rules concerning F2D Combat. Most of the content in this guide could also be used for class F2E. the FAI sticker and check that the Model Specification Card (One per model type) is filled in, signed and stamped. Note: Although checked at processing this is not a certificate that a competitor’s equipment can’t be a source of disqualification in the competition. If the centre (pilot) circle is laid out on other material than grass it is recommended that this material have a maximum radius of 4 metres although the pilot (centre) circle must be marked with a radius of 2 metres. Circles are best marked using white paint or chalk but also plastic strip can be used except for the pilot circle. If plastic strip is used, the organiser must make sure it is laid out and fastened in such a way as not to cause a trip hazard to pilots or mechanics. Contestants not directly involved in the organisation or flying in a heat should always be requested to withdraw behind the safety fences or outside the contest area. Spectators and others not involved in the Combat Contest must at all times stay behind the safety fences or at the allotted places. The safety strap and shut-offs must be used at practice flights. There is no rule saying that the mechanic(s) must be of the same nationality as the competitor. This means that a single competitor from a country can find and employ mechanics at the World or Continental Championships. The only demand is that they possess a valid Sporting License and are not registered for another National Team. When the pilot is outside the centre circle for other reasons than picking up the handle or waiting for his model to be serviced all rules that apply to mechanic(s) also apply to the pilot. 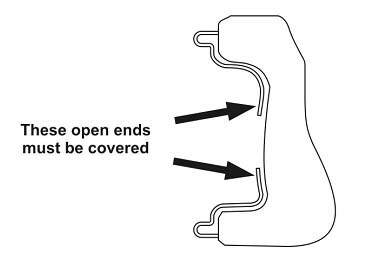 b) All handle and line connections should be covered in such a way not to interfere with the opponent’s lines but not longer than necessary to cover the connectors. More than one connector per line at the handle and at the model aircraft is not permitted. Note that open connection connectors are not allowed (see sketch). Pilots using this type of handle must tape the handle before the heat. k) When referring to the engine shut-off (engine stop) device this cover both the anti fly-away device (shut-off) and the system used to stop the engine at the pilots will. d) Demonstrations of a working shut-off can be requested at random. e) When pull testing the safety wire it is recommended to ask the competitor (owner of the model) in what direction to pull. The mechanic(s)/pilot can not ask for another streamer just to save time in a heat, for example if it is wrapped around the lines. All parts of the opponent’s streamer/string should be cleared from your own streamer/string before re-launching. No matter if the competitor uses a metal ring or not to attach the streamer to the model, the string should have a single loop and one knot. f) When the model is launched the pilot should walk directly into the centre circle. It is the responsibility of the competitor to make sure where the Circle Marshal is to avoid running into him. h, i) At take-off and before the signal to start combat the models should fly level in an anti-clockwise direction. The competitors are not allowed to do any loops or other manoeuvres unless asked to by the Circle Marshal in order to separate the models. Take-off should take place in level flight forward, not upwards or backwards. Any contravention of these rules will result in a disqualification. k) In conditions of heavy wind, a grounded model which does not have a running engine may be moved to a safer launching position under supervision by the Judges. While doing this, the mechanics are not allowed to carry the model aircraft and lines over an opponent’s grounded model aircraft and/or pitting crew. Parts of a crashed model aircraft are not considered a grounded model aircraft. l) The mechanic(s)/pilot may move around in the vicinity of their pitting position. n) The pilot will receive a yellow card if he uses a rough or unsafe flying style, causes a line tangle or shows unsportsmanlike behaviour. The Judges/Circle Marshal shall not hesitate to give a yellow card to keep the level of combat on an acceptable and fair level. A yellow card can be given during the heat or after the heat when the Judges/Circle Marshals have had a chance to confer about situations in the heat. The first yellow card is a 40 point penalty while the second and/or third yellow card is a disqualification. If the first yellow card incident is considered severe, the pilot shall also be disqualified for this offence. o) The scorers must be observant and aware that the heat can be stopped. c) The scorers’ times should be rounded down to the nearest whole second and then added together. The added result should be divided by the number of scorers, and then rounded down to the nearest whole second. This result should be the competitor’s official time in the heat. If any scorer’s time shows a significant deviation from the average, it should be excluded (but still noted on the score sheet). The scorers must be observant and stop their watches if there is a fly-away of the model they are scoring. c) A reflight may be granted if, for instance, the model is stuck high up in a tree or in a safety net where it will take too long, or be impossible to retrieve the streamer. a) No penalties should be given to the pilot if he is pushed out of the circle. Instead his opponent should receive a yellow card or be disqualified (4.4.12.C.e) unless the Circle Marshal consider it an accidental incident where neither of the pilots is to blame. b) In order to reach a grounded model the mechanics are not allowed to cut across the flying or pitting circle (See sketch). 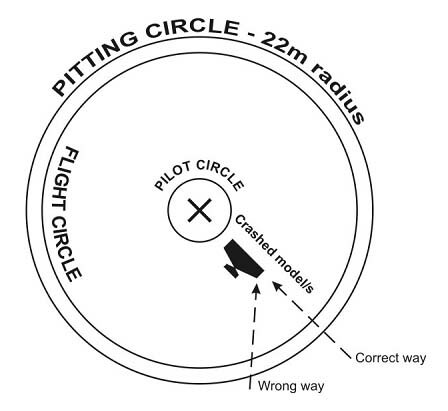 If a model is crashed close to the centre circle it is especially important for the mechanic(s) are observant regarding the point at which to enter the circles. A penalty should be given if, for example, the pilot picks up the crashed model on one side of the centre circle and brings it out on the opposite side of the circle. c) Be observant that all line tangles must be cleared before the model is serviced or the streamer is moved to the spare model (Except for the case where both pilots have the permission of the Circle Marshal to continue). This rule is also valid if the model is outside the flying circle, for example due to a fly-away. a, b, c and d) The scorers must be observant and stop their watches if this happens for the model they are scoring. a) This means that a model without a silencer, a working shut-off, a streamer hook etc can not be used again until repaired. c) For safety reasons it is not allowed to attach tools, weights etc to a crashed model to compensate for a lost outer wing. f) If lines or handles are dragged into the centre circle by accident the Circle Marshal should order the pilots to cease combat and fly level until the circle is cleared and it is safe to continue. h) It is the responsibility of each competitor and his Team Manager to be aware of when his flight is scheduled. m) Crossed lines which do not interfere with the course of the heat are not a problem and is no reason for disqualification. If the spare model aircraft is needed to take-off and it is prohibited by the crossed lines of the opponent then another situation is created and rule 4.4.12.C.u is applied: Interference with his opponents equipment. o) When a pilot without a streamer chooses to fly level and combat still is going on, and his opponent flies in such a way to cause a crash or collision he will be disqualified. p) This situation must be carefully watched by the Judges and if the streamer/string can be suspected to have been hit or partly cut in a previous attack or mid-air collision it should be counted as a cut for the opponent. q) A part of the string must always be attached to the streamer retaining device. Only the metal ring (if used) is not enough. If the streamer retaining device is bent or missing due to a mid-air collision the pilot should not be disqualified. Also, if the string is missing and device is intact but the model is damaged close to the device and it can be concluded that the string is cut in the loop no disqualification should be given. u) For example any tampering with the streamer in any way, shape or form can result in a disqualification. This rule can also be used to disqualify a competitor due any other breach of the rules that is not covered in a separate paragraph. Note that is only the Judges/Circle Marshal/FAI Jury that can decide if they want to look at the video recording or not. A competitor can make a request or give in a protest after a heat but if the Judges/Circle Marshal feel certain, they should not be obliged to look at the video recording. f) Although this competitor will fly his heat in the following round his score will count to the round where he was the odd one. i) A junior fly-off follows the rules in 4.4.14.h. a) It is of most importance that the Judges have a good understanding of the rules and that they have a common language as this will reduce delays and possible errors. The Circle Marshal has the main responsibility for the centre circle and the pilots and their behaviour although all Judges have the right to give penalties. Penalties may be given after a heat when the Judges/Circle Marshal have had a chance to discuss situations that occurred in the heat. In case of three Judges one should be assigned to each pilot and his mechanic(s) while the third Judge will have an overall function. The Judges must work together and watch any models landing/crashing close to them. b) All scorers should count cuts as well as record airtime for the competitor. Every scorer should have a notepad where he/she can make records of the number of cuts as well as the air time (after the heat). A good way is to divide the six scorers into three groups of two and spread them around the circle. Each group will consist of a scorer for each pilot and they should be instructed to talk to each other during the scoring. If, after the heat, the scorers have a different cut count they must conference and try to come to a decision. They also have the possibility of asking the Judges for advice.